The Slideshow Header is a new feature for our WordPress sites that allows you to display a slideshow in the header of your site. 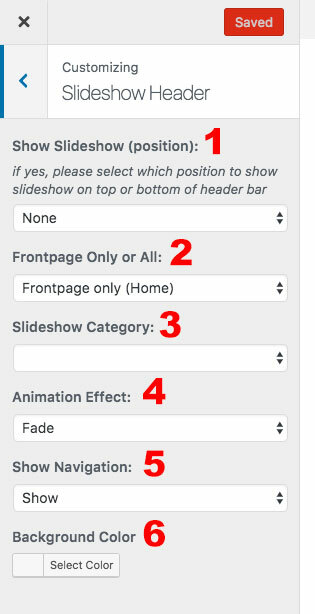 This post gives instructions on how to put a slideshow into your site’s header. 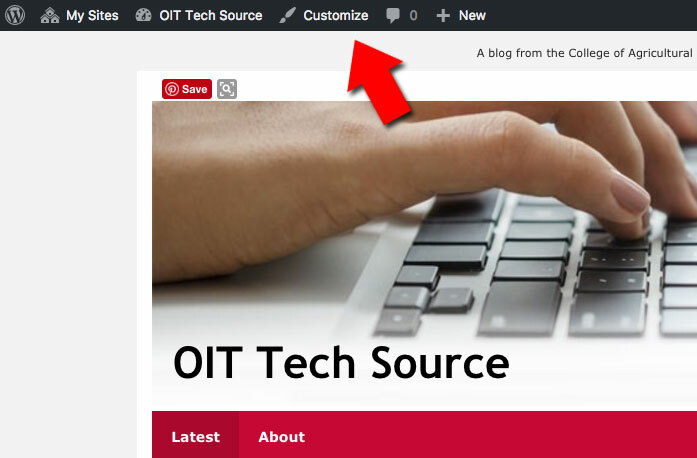 Start by finding the “Customize” link. 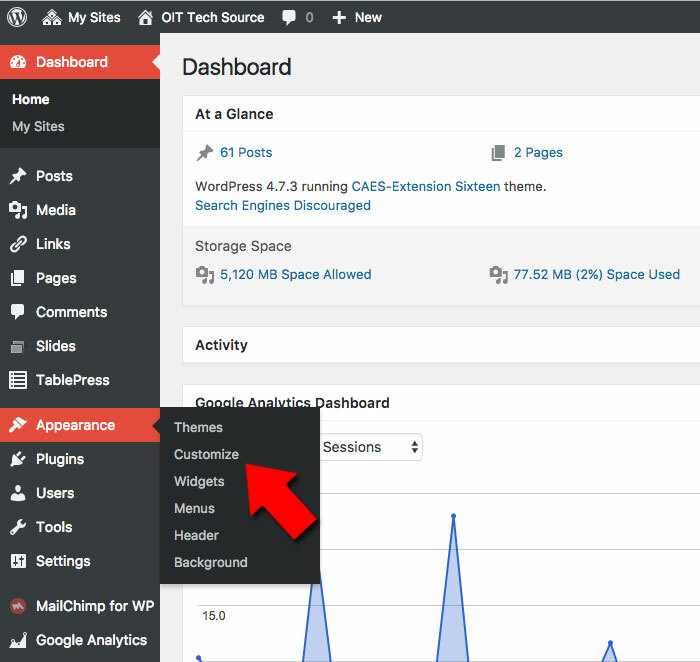 Either click “Appearance” > “Customize” if you’re on the admin panel, or click on the top black bar and select “Customize” if you are viewing your site. Next, select “Slideshow Header” from the list on the left side. Show Slideshow (position): Determines where to display the slideshow, either above the header image, below the header image, or below the menu navigation bar. Select “None” if you don’t want the slideshow to appear in the header. Frontpage Only or All: Display the slideshow only on your site’s home page? Or on all posts/pages? Slideshow Category: Select the category you want to show the slideshow on. Animation Effect: Select from a few different animations for transitioning your slides from one to the next. Show Navigation: If navigation is shown, circles will be displayed representing each slide, allowing a user to click back and forth between slides. Background Color: Allows you to set the navigation color, if desired. 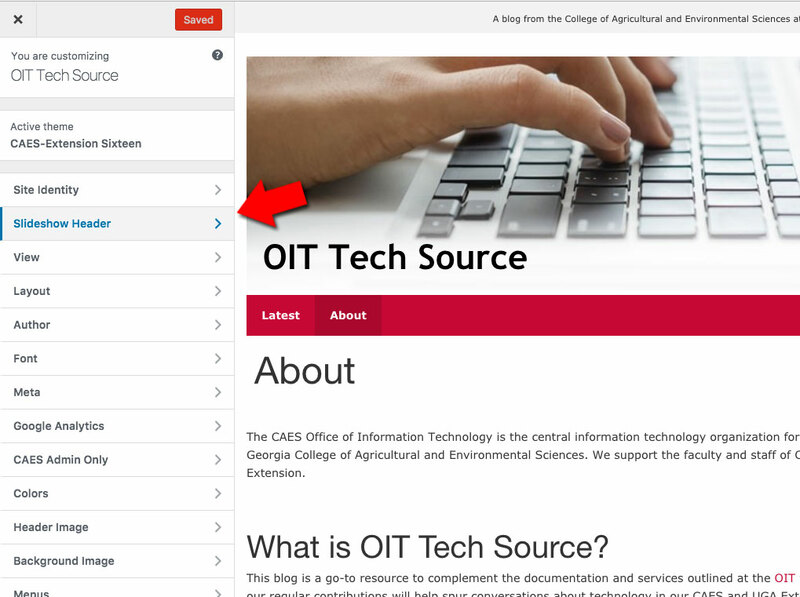 Once you set it up, don’t forget to click the “Save & Publish” button at the top. Hope you enjoy it! Posted in WordPress. Bookmark the permalink. A web developer with OIT, Mikey provides support for WordPress services.